Tomorrow I will have the privilege of speaking at a B.I.G. (Believe, Inspire, Grow) Group on “Streamlining Your Day — For Maximum Productivity & Joy.” One thing I will ask the Group is at the end of each day, how do they feel about their accomplishments for that day? Are they content and fulfilled or are they overwhelmed and depressed? So as the day comes to a close, I ask you the same questions? Do you feel it was productive and are you feeling fulfilled? Those questions are the beginning of taking the first step to streamlining your day! Whether you are a stay at home mom, a working mom, or a single individual, we all have much on our plates to do each day. Just like the closets, attics and basements in our homes can become cluttered with items, our lives and schedules can become filled with clutter. You can live a life more fulfilled when you reduce the clutter caused by not prioritizing your time. Manage your schedule by looking for things to remove. If it does not give you joy, provide you with something in return (we need our jobs), or enrich your life, consider dropping it from your schedule. Learn to use the word “No” more frequently. We can get in the habit of allowing others to fill our schedule with projects, opportunities or Events. If someone asks to you volunteer your time, don’t immediately say yes. Give yourself time to really see if this is something you can fit into your schedule AND is it a cause in which you feel worth giving your time to. Keep 1 or 2 central household lists for things such as grocery items, household supplies and other necessary purchases. As you use up an item or get close to using it up, put it on the list. You can have one general list or several smaller ones for separate shopping destinations. Make shopping lists so you can make fewer runs to the grocery store. DO NOT go to the grocery store without a list. I do a weekly meal plan where I decide what I am going to cook everyday for dinner. I then check to be sure I have all the ingredients. This prevents intermittent runs to the grocery store during the week. I like to do my shopping once a week. 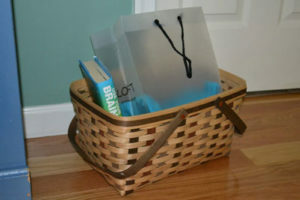 Keep a basket or tote by the door and place all items that you need to return (Library items, store-bought items you don’t want) or give to someone. I have a lovely Longaberger Market Basket that I keep by the door with all my items waiting for me to do something with. When I’m ready to run my errands, I pick up the basket and put in the car. I don’t have to run around the house trying to locate things. Are your mornings a stressful time as you are rushing to get out the door? Plan on “planning” the night before and get everything ready for the morning. Choose the clothes you want to wear and if they need ironing, iron them the night before. Makes lunches in the evening for the next day. Have the kids get their backpacks ready by the door … or even put in the car if you drive them. Wake everyone up early enough so they can have enough time to make their beds, eat a good breakfast, gather their items and get out the door. Have each child choose only one extracurricular activity they can do each week. You need to be sure that there is family time each day or at least several times a week. Try to do some cooking on the weekends and place the meals in the freezer. So if you are having a late work day, meals are already prepared. Or if the budget allows, use local meal preparation services to bring you meals. Removing clutter from your schedule might seem impossible, but there is usually at least one thing we can all try to do less of and still lead full and productive lives. So do you have ideas to add to the list? What things do you do to streamline your day? Share with us and let us know what works for you.